This notice applies to all information collected or submitted on this website. On some pages you can make requests and register to receive materials. The types of personal information collected at these pages are: Name, Company, Phone number, Email address. We use the information you provide about yourself on our website to allow us to send you email and updates that may be of interest to you. We may also use return email addresses to answer the email we receive. Such addresses are not shared with outside parties. 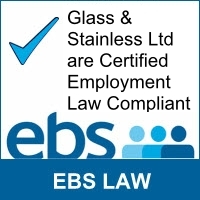 You can access all your personally identifiable information that we collect online and maintain by e-mailing us at info@glassandstainless.com. We use this procedure to better safeguard your information.